What Causes the Unpleasant Odor Inside My Maytag Washing Machine? Why Would a Whirlpool Washer Smell? Whirlpool Corporation manufactures top-loading and front-loading washing machines under the various brand names Whirlpool, Kenmore and Maytag. A washing machine may smell musty or moldy for various reasons, from defects in the washer design to improper use of detergent or fabric softener. Drain water may collect under the drum, causing odors. 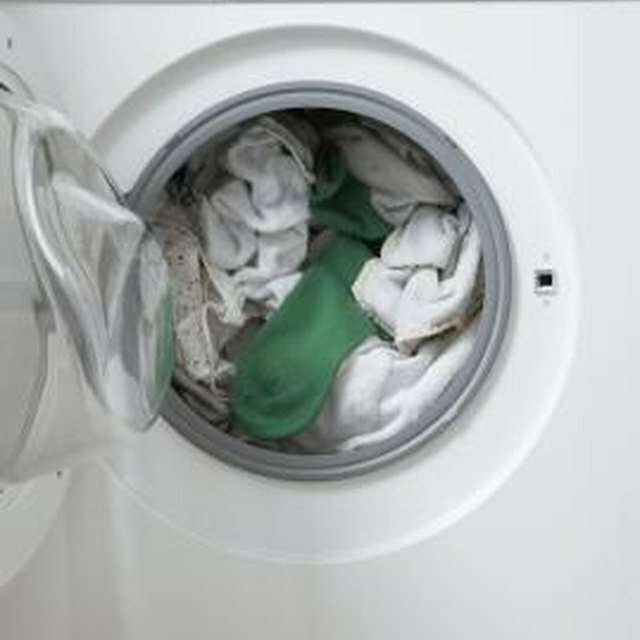 Most washing machine odors are caused by improper water drainage. Water and detergent residue might collect in a puddle inside the drain pan, below the drum or in small crevices within the washer. Bacteria thrive in the residual organic sludge, causing a sour or musty odor. A washing machine normally experiences an occasional bout of odor arising from an exceptionally dirty or heavy wash load that does not completely drain, but a chronic odor problem belies a more serious cause. Unhappy consumers who purchased the Whirlpool front-loading Whirlpool Duet, Duet Sport, Whirlpool Duet HT and Kenmore HE washing machines have sued Whirlpool Corporation and Whirlpool distributors for negligence and compensatory damages. Plaintiffs from Canada and the United States allege that a manufacturing defect in the design of the washers cause mold and mildew to form in the washer. These washers apparently have cavities and crannies that fill with "scrud," a mixture of improperly drained water and the dregs of detergents. The alleged defective design of these Whirlpool washers does not allow for the thorough cleansing and proper air circulation during and after wash loads. Whirlpool has directed consumers to use Whirlpool's "Affresh" cleaning tablets and open the washer doors and dispenser drawers in between loads for better air circulation. Other factors can also contribute to improper draining. Worn washing machine parts or components may inhibit water drainage. The timer may stop too soon, causing the machine to end the drain cycle too soon. The water sensor may be malfunctioning, causing washer water levels to rise beyond the programmed drain level. In some cases, a washing machine lacking a backflow valve or a washing machine situated below the level of the septic tank or sewer line may be receiving backflow from the drain pipes of other fixtures in the building. Too much detergent causes washing machines to smell. According to the Wall Street Journal, 53 percent of people do not use the recommended amount of laundry detergent per load. Excessive detergent and fabric softener build up inside the washer, creating havens for mold and mildew. Additionally, overloading the washer inhibits the proper draining of waste water, causing the water to pool inside the washer's drain pan. Washing machine manufacturers and detergent companies recommend that users follow directions and avoid excessive softeners and perfumes in the wash load. Why Does My Front Load Washing Machine Fills Up Then Overflow?